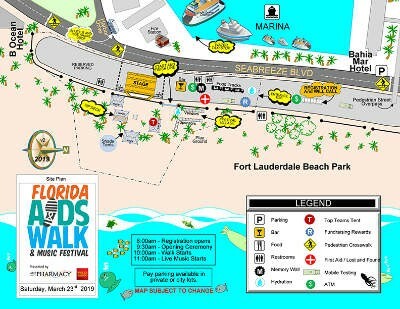 Come together for a 5K walk, food trucks, bars (with alcohol and non-alcoholic options), a Festival Village featuring local vendors, shade tents in the sand and an epic concert featuring Shaggy, Big Freedia, The Struts, Celebrity Emcee Bianca del Rio, and many more (click here for the full line-up)! Be sure to visit the beneficiary organizations’ tents to learn more about their services in the community, as well as our sponsor tents for goodies and swag. We’ll also have a selfie spot with fun photo opportunities for you and your friends, as well as a Memory Wall to reflect on why we’re here and remember those we have lost to HIV/AIDS. 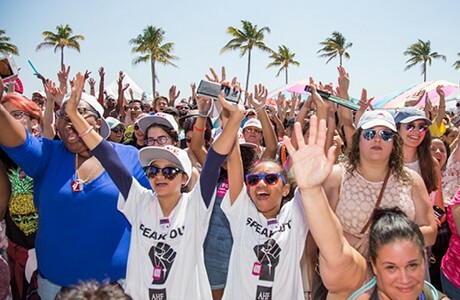 It takes all of us to end AIDS, so let’s come together to save lives. Click here for parking and transportation info. Make absolutely sure to bring your camera or phone. Tag all your social media posts with #FAW and #FAW2019. Follow us on Facebook here and Instagram here. Mistress of Ceremonies Bianca Del Rio, of RuPaul’s Drag Race, will preside over an epic concert with Shaggy, Big Freedia, The Struts, DJ Alex Ferbeyre, Coast City, Deep Fried Funk Band, Prada Gino and Tracy Young. Click here for more info.